These crostini are the perfect holiday snack or even lunch. While you can use any type of bread, I found a cranberry walnut bread worked well with the flavors. On one sheet tray, toss together sweet potatoes, 1/2 tablespoon olive oil, and sea salt. Spread out into a single layer and roast sweet potatoes for 25 minutes or until soft. On a separate sheet tray, toss together pecans, maple syrup, and the pinch of cayenne if using. Roast pecans for 12 minutes, remove from oven, and let cool. Once sweet potatoes are soft, combine with goat cheese and 2 tablespoons heavy cream in a food processor. Pulse until smooth. Add remaining 2 tablespoons heavy cream and pulse until mixture is light and has a light texture. 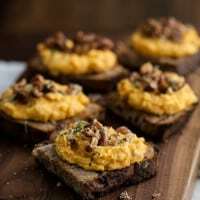 Assemble the crostini with a smear of the whipped sweet potato, a sprinkle of the pecans, and finish with a bit of rosemary. *milk would also work in place of the heavy cream.